The scholarship programme is open to Malaysian citizens who have completed their SPM or IGCSE exams or who were born between 1st September 1999 and August 31st 2001, with a high proficiency in English and from a family who could not normally afford to attend the school but who demonstrate the potential for excellence. They will be eligible for Year 12 and 13, academic years 2017-2018 and 2018-2019. - stating your date of birth, current level of education (e.g. completing SPM in Nov 2016, completing IGCSEs in July 2017 etc) and current school. - providing an overview of why you would like the scholarship and what your future aspirations and plans are for future study/employment. - providing an overview of any academic or extra-curricular success. 2. Your school records/reports. This must include either your SPM results or IGCSE current grades AND predictions. 3. The name and email address of a tutor/teacher/Headteacher at your current school. If shortlisted we will contact this person directly for a reference. 4. The size of the financial award is needs dependent, therefore you must provide evidence of joint family income including contact information for employers (e.g. recent payslips/EPF form). Following receipt of applications, selected applicants will be invited to BSKL for an examination. Following the exam, successful candidates will be interviewed by the Head of Secondary and the Head of Sixth Form. 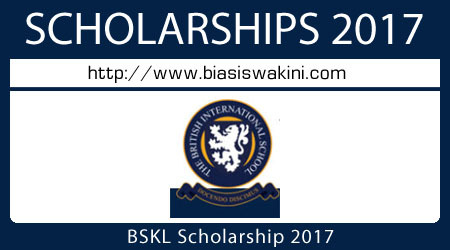 0 Komentar untuk "The British International School Of Kuala Lumpur Scholarship 2017"